Choosing A Color For Your Mid-America Exterior Vinyl Shutters! Our vinyl shutter color choices can dress up your drab house. Here are a couple of thoughts on how to choose the color for your exterior shutters. If your house is painted with a dark color, you might choose a lighter shade of the house siding color for them. 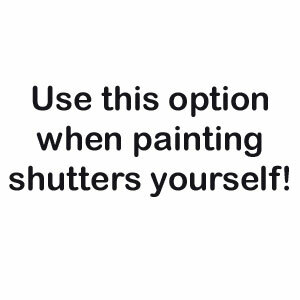 Using that same idea, if your house color is on the lighter side think about a darker shade for the shutters. The shutters should add some contrast and make you feel good about your house. Of course, on a lighter color house one of the most popular colors to use is black. Remember whatever you choose have fun with the color. IMPORTANT NOTE: If color is critical please REQUEST COLOR SAMPLES HERE to be mailed to you! Even with our useful Mid-America color chart, the hues can look different on your computer monitor than what you see below. NOTE 1: Colors for Mid-America building products can look different on each computer monitor. If color is critical please REQUEST COLOR SAMPLES HERE to be mailed to you! As you can see in the chart above, Mid-America vinyl shutters are available in the most popular colors. The color is in the vinyl material, so it is a color through vinyl product. Since the color is all the way through the material you don't need to worry about the finish scratching or peeling off. In addition, the vinyl material has UV inhibitors in the vinyl to help the fade resistant properties. Mid-America's Lifetime Warranty will give you peace of mind since it is backed by the largest vinyl shutter manufacturer in the world, so you can buy with confidence.